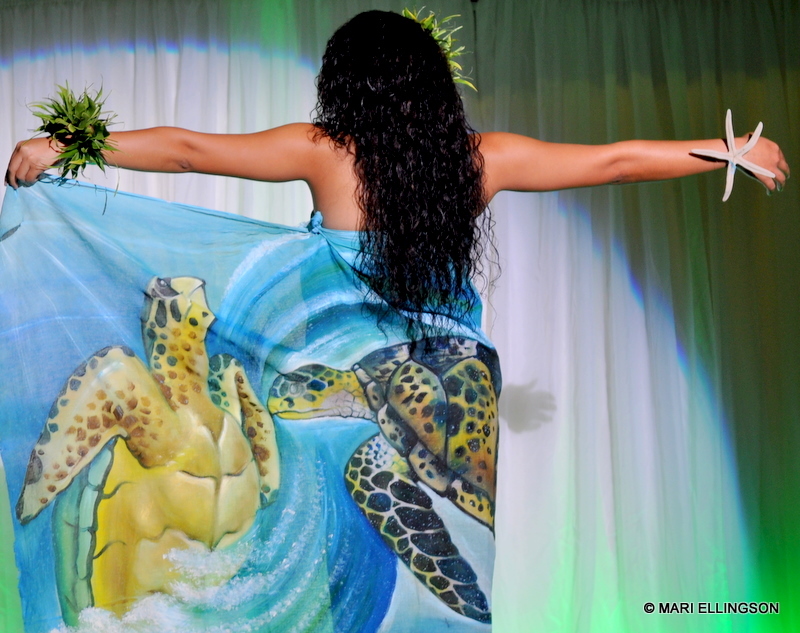 I realised how much the turtle means to people of the Pacific Islands when I saw the sarong designs and prints sported by the 2010 Miss South Pacific Pageant contestants in November last year here in Port Moresby. Here are some of the reminders on the Sarong and Talent judging evening at the Lamana Hotel. Miss American Samoa - an award-worthy print! There should be two additional award categories: one for the prints on the sarong and the other for sarong design. As you can see from these photos, the attention to detail and style needs to be recognized and rewarded. Miss Samoa - stunning idea! 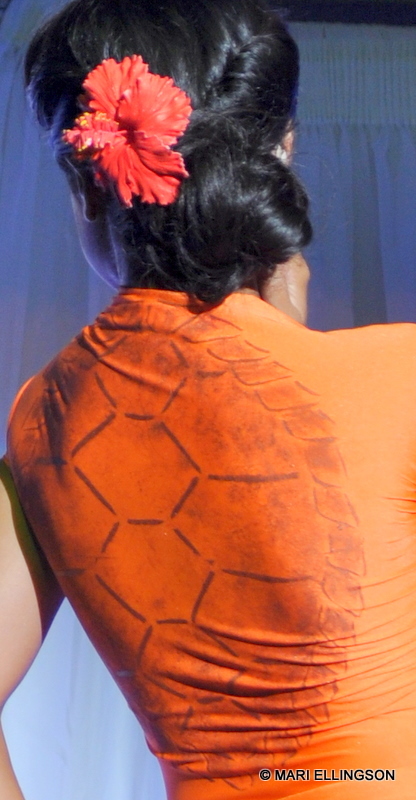 The shell pattern on a turtle's back. We can find turtles practically anywhere in the Pacific Islands – from Hawaii to Papua New Guinea. Each of us have a special connection to this marine animal. The turtles live in the sea and lay their eggs along the sandy beaches of our lovely islands. These prints and designs show that connection. 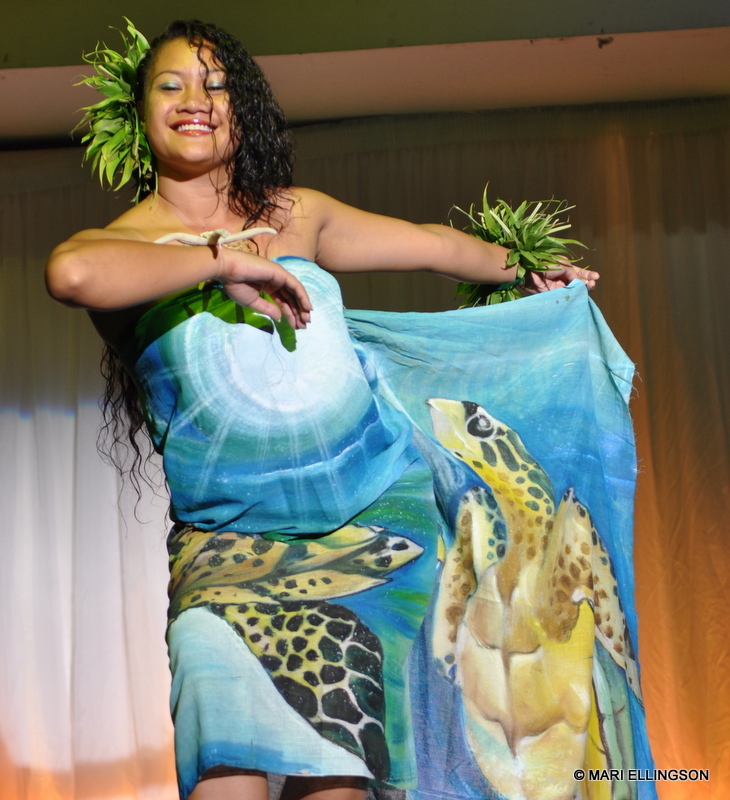 What comes to mind when I watched the contestants in their sarongs and these designs and prints is that the turtle has a very significant place in the cultures, as well as the cuisine of the Pacific Islands. In Samoa one of the top 10 tourist attractions is swimming with turtles. In Hawaii we find the legend of the sea turtle called ‘Kauila‘. I am sure there are a few legends and myths about of sea turtles that go beyond the Pacific Islands. That means that the sea turtle is a migratory species and can be found also in Asia and the Caribbean. In some parts of PNG turtle meat and turtle eggs are a delicacy. In Daru, Western Province the popular turtle meat dish is called isi dou. I tried making isi dou wrapped in foil – not the real thing to use but the taste was exquisite! So I was told by my relatives who enjoyed the dish immensely. I will end this post by sharing a great article on sea turtles which I am sure we can identify with – the protection and preservation of these animals and also a Fact Sheet titled “Sea Turtles of the South Pacific” published by the South Pacific Environmental Programme (SPREP) which gives an overview of the variety of sea turtles, life cyle and other very important information about these marine animals. May the turtle live on and continue to be an icon of the Pacific Islands. “Felicia” Weakens But Pohoiki Got Some Cool Waves! Wait a minute, who are “Felicia” and Pohoiki? You may well ask. “Felicia” was the forecasted tropical storm that was advancing towards the Hawaiian Islands and Pohoiki a worldclass surfing spot on the Big Island Hawaii. According to recent reports it has weakened so the islands avoided an onslaught of a tropical storm. This is very good news and a great relief no doubt to many in the Islands. I was following the Mayor of Honolulu’s tweets on Twitter who was giving updates on the status of ‘Felicia’ who he just said has fizzled out. But he has warned his constituents to stay alert as it is still the hurricane season in ‘paradise’. Land of the graceful Hula, fish and poi, awesome pali, the luau, Kona coffee, noni, muumuu, poke, Waikiki Beach, active volcanoes, Don Ho, aloha and many, many more wonderful experiences. Some have found a way to challenge the challenger: mortal man versus the might or then might of ‘Felicia’ by going out to sea to meet the surf at Pohoiki on the Big Island of Hawaii…ugh! Pohoiki has very high traffic of serious surfers and surfing enthusiasts. For more information on Pohoiki and surf events the official site is http://pohoikisurf.com. It is a really cool site – yeah for me da URL only! I am relieved to know that “Felicia” fizzled out, to use the Mayor’s words, when it neared the coast of the Big Island. I like this story very much so am relating it here and I hope you’ll enjoy it too. A wonderful account almost a narrative of a play as it unfolded. Lovely photos of the coastline and of course the surf. Author islandmeriPosted on 12/08/2009 08/12/2009 Categories Nature, Papua New Guinea & the Pacific IslandsTags Big Island Hawaii, Felicia tropical storm, Hawaii, Honolulu, hurricanes, popular surfing sites, surfing, top surfing sitesLeave a comment on “Felicia” Weakens But Pohoiki Got Some Cool Waves!